At some point, you may want to enlist the aid of a home care provider to assist your senior loved one with daily care. While many agencies are available, you must consider various factors before deciding on which professional team to hire to ensure your loved one receives the best care possible. Here are a few questions to ask that can help you determine the quality of care your loved one will receive. 1. Is Your Facility Licensed by the State? Many states or cities require home care agencies to acquire licensing. Government agencies are then able to routinely review various aspects of the facility’s operating practices to ensure they meet a specified level of care. Potential clients may then also check the agency’s report card online in lieu of government reports. Another factor to consider is whether or not the business is certified to care for Medicare clients. If not, determine the reasons why. One of the most challenging tasks of helping an elderly relative age in place safely and comfortably is researching home care agencies. Huntington families can turn to Home Care Assistance for reliable, high-quality in-home care for aging adults. We offer 24-hour live-in care for seniors who require extensive assistance, and we also offer respite care for family caregivers who need a break from their caregiving duties. 2. How Does Your Agency Screen Employees? To ensure the health and safety of seniors, home care agencies should perform background checks and require physicals and drug tests before hiring any employee. Reputable businesses also often require references. The more information an agency requires, the higher the likelihood they hire employees based on higher standards. 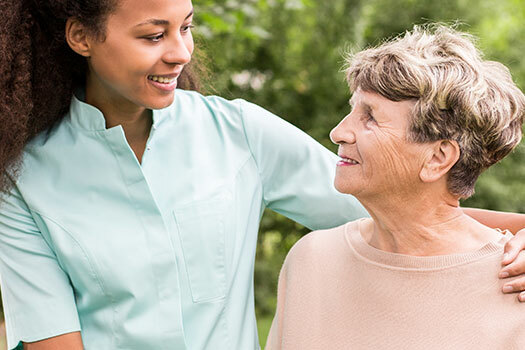 If your aging loved one needs help managing the tasks of daily living and you’re searching for a reliable, expertly trained caregiver, Huntington, WV, Home Care Assistance is your top choice. At Home Care Assistance, our caregivers strive to make aging in place a safer and more comfortable experience for seniors so they can enjoy their golden years in better health. 3. What Are the Experience and Training Levels of Your Caregivers? Some agencies may require all their employees to have state certification or licensing depending on the level of training and care they are qualified to provide. Caregivers who possess credentials typically need to undergo ongoing training to keep their certificates or licenses. Make sure the caregiver assigned to your loved one has the experience necessary to provide the type of care your loved one needs. 4. Is Care Provided by a Routine Employee? When having care provided by one or two familiar faces, seniors often feel more comfortable and at ease if they need assistance with intimate tasks like bathing, dressing, and toileting. Routine caregivers are also more likely to notice changes in behavior or health, which may then need to be passed on to family members and health care providers. 5. How Does Your Agency Communicate with Family Members? Determine if family members are kept in the loop of care plans and changes in the type or level of care provided. Does the agency welcome input and care requests made by family members? 6. What Happens in Case of Emergencies? Find out if employees are certified in CPR and first aid, and consider how they might handle a medical emergency. Make sure the home care agency has an emergency response plan in place. 7. Does Your Agency Create Care Plans? Care should be based on each client’s individual needs, which are determined by extensive interviews with family members and the senior. Care plans are created to acknowledge and address the level of care required for each need, and they should also be reassessed periodically to note improvements or setbacks. Changes in care should be applied accordingly. Although it may be challenging to find a reliable, highly rated home care company, Huntington, WV, families can turn to Home Care Assistance. Our respite and live-in caregivers are expertly trained to assist seniors with a wide array of important tasks, including cooking, bathing, light housekeeping, and exercise. Call (304) 521-2909 today to learn how we can customize our services to meet your loved one’s unique needs.